In Singapore, Nanyang Technological University scientists developed a sustainable way to demonstrate a new genetic modification that can increase the yield of natural oil in seeds by up to 15 per cent in laboratory conditions. The new method can be applied to crops such as canola, soybean and sunflower, which are in a multi-billion dollar industry that continues to see increasing global demand. The team’s patent-pending method involves modifying the key protein known as “Wrinkled1” or “WRI1”, which regulates plants’ oil production. After modification, the seeds have a wrinkled appearance, which is the basis for its scientific codename. The ability to increase oil yield in a sustainable manner is expected to result in higher economic gain. Past research has shown that a small 1.5 per cent increase in oil yield (by dry weight) in soybean seeds equates to a jump of US$ 1.26 billion in the United States market. In Washington, D.C., the Renewable Fuels Association reports that on April 11, EPA initiated the process for reviving one provision within the Nov. 2016 Renewables Enhancement and Growth Support (REGS) rule in an effort to provide more transparency regarding small refinery exemptions (SREs) from the RFS program. EPA had proposed to codify a determination that would reveal basic information about SRE petitioners (e.g., company name, refinery location) that currently can be claimed as confidential business information (CBI). A 15-day comment period will open once the official version of EPA’s Request for Further Comment is published in the Federal Register. The timing of this action is fitting as EPA continues to rack up more SREs, as indicated by the agency’s April update of its Small Refinery Exemption dashboard. This latest revision reflects another pending 2018 RFS waiver, which raises the number to 40. RFA recently assessed ethanol consumption and blend rate consequences of the SREs—view the white paper here. We applaud EPA’s long-overdue focus on greater SRE transparency, and continue to urge the agency to adopt a more judicious and restrained decision-making process. In California, the California Energy Commission (CEC) awarded Southern California Gas Co. (SoCalGas) a $3 million grant to fund the next phase of development of a new technology that doubles the amount of renewable energy created from the decomposition of organic material at wastewater treatment plants. The new process, known as Hydrothermal Processing (HTP), reduces greenhouse gas emissions by three times that of traditional anaerobic digestion and costs about half. According to their press release, HTP is highly efficient, using heat and pressure to capture 86 percent of the energy in the waste and using only 14 percent to process it. A pilot project, to be located at the Central Contra Costa Sanitary District Wastewater Treatment Plant in Martinez, California. The work is being funded in part by the California Energy Commission, SoCalGas and other private participants. In the Netherlands, Nouryon (formerly AkzoNobel Specialty Chemicals) announced the 13 finalists for the 2019 edition of its Imagine Chemistry collaborative innovation challenge. The winners for sustainable bio-based surfactants (in partnership with Unilever) are CarbExplore Research, Fraunhofer IGB, Sironix Renewables, and The University of Sheffield + Entomics. The finalists will participate in an intensive three-day event in May at the company’s RD&I center at Deventer, the Netherlands, where they will work with Nouryon experts and business leaders to further develop their ideas into a joint value case. Imagine Chemistry was launched to tackle chemistry-related challenges and uncover new ways to create value for customers. The 2019 edition generated more than 160 innovative ideas from startups, scale-ups, university spin-outs, and other potential partners. Winners are granted awards ranging from joint development and research agreements to dedicated support from Imagine Chemistry partners. Unilever, for example, a key customer of Nouryon and a partner in the “Sustainable bio-based surfactants” challenge, offers the opportunity for winners to collaborate with its R&D teams and test facilities to move their ideas to the next phase of development. In California, Amyris, Inc. sold its Vitamin E royalty agreement to Koninklijke DSM N.V. (Royal DSM). This agreement assigns Amyris’s rights to Vitamin E royalties to DSM in exchange for total consideration of approximately $57 million. In addition, DSM and Amyris have agreed to a further manufacturing cooperation for Amyris products at DSM’s Brotas facility that provides additional capacity and lower cost of goods sold with an expected approximate aggregate benefit of $30–$40 million over the next three years. The expected economic benefit of both agreements to Amyris is approximately $90 million. As a result of this agreement, Amyris has now fully exited the Vitamin E business and is focused on driving commercial growth in the major markets it is already successfully disrupting: flavor and fragrance ingredients, skincare, sweetener, and most recently, entry into the cannabinoids market. These are markets where Amyris is demonstrating market leadership with its products, brands and resulting underlying growth and margin. Terms of the agreement with DSM will be more fully disclosed in a Form 8-K to be filed later this week with the Securities and Exchange Commission, available free of charge at sec.gov. In Canada, Cielo Waste Solutions Corp. announced that, prior to adding the desulphurization unit, on which Cielo is currently working, the Company has achieved an important milestone by selling the first 5,000 liters of high grade renewable diesel to its first customer at $1.00 per litre. This sale confirms that, even before desulphurization occurs, there is a potential market for Cielo’s renewable fuels, which are being produced by converting wood waste into a saleable renewable diesel product using Cielo’s proprietary process. Once the desulphurization equipment is installed, Cielo anticipates being able to sell the Company’s high-grade renewable fuel for much higher prices per liter into the mandated renewable fuel market in Canada. Cielo’s first client is a servicing company that will be utilizing the renewable diesel as “off highway diesel” (i.e. for use in generators, gravel crushers, etc.) Cielo has been advised by the customer that the initial purchase is for a small batch to test on the customer’s equipment, after which it intends to purchase significantly higher volumes in the future if the diesel performs as expected. In Maine, the Board of Directors of the Maine Technology Institute (MTI) approved two awards from the Emerging Technology Challenge for Maine’s Forest Resources, each for $750,000. The two companies receiving the awards represent different natural resource-based technologies that make use of Maine’s abundant forest resources and supply chain. in Belfast, Maine, will transform the insulation market in the next 10 years. Its insulation, made from wood fiber, is renewable, recyclable, nontoxic, and performs as well, or better than, other available insulations. The second $750,000 award was made to Biofine Developments Northeast (BDNE). The funding will allow BDNE to carry out the commercial development of the first large scale bio-refinery deploying Biofine’s technology in Bucksport, Maine. This plant will enable the conversion of woody biomass to the chemical intermediate, levulinic acid allowing economic production of a completely renewable heating oil substitute. The Challenge was part of MTI’s collaboration with the Forest Opportunities Roadmap (FOR/Maine) in supporting the development and/or attraction of emerging technology companies in the forest resource sector, using Biobased Maine as an external contractor to vet and evaluate the proposals. Some of us were born already, some of us just a twinkle in someone’s eye, but 49 years ago history was made with the very first Earth Day. What was a nationwide celebration and peaceful demonstrations for environmental reform in the U.S. by some estimated 20 million Americans, Earth Day events have now expanded to over 193 countries and more than a billion people every year. The top 5 CO2 producing countries in the world are China, the U.S., India, Russia, and Japan, and according to Scripps Institution of Oceanography scientists, levels of CO2 reached a startling record in February of this year…earlier in the year than expected making it even rarer and unexpected. “In most years, the previous maximum is surpassed in March or April. 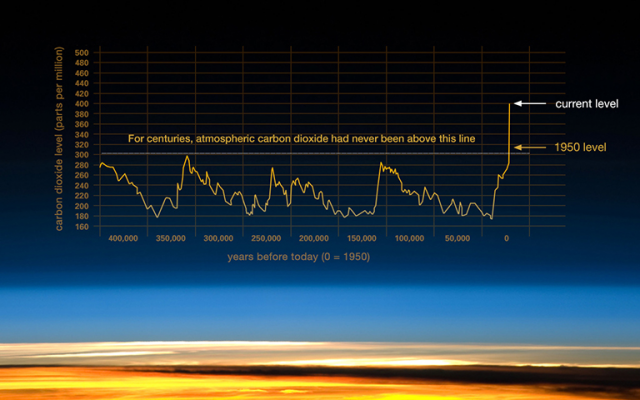 The February record breaking is a measure of just how fast CO2 has been rising in the past months,” said Scripps CO2 Group Director Ralph Keeling, in a statement. The suddenness of this year’s record is the result of “the combination of weak El Nino conditions and unprecedented emissions from fossil-fuel burning,” according to Keeling. This year’s carbon dioxide level is expected to peak around 415 parts per million in May. While deforestation, agriculture and fossil fuel use are the primary sources of CO2, some say don’t bother playing the blame game since we can’t change the past, we can only change the future. So let’s talk about that. What are we doing? What else can we do? Some people celebrate Earth Day by planting a tree, but how about planting hemp or miscanthus instead? Both are considered carbon negative crops and very promising for biofuels, bioplastics, biochemicals, and many other biobased products for today’s world. Maybe that is why Pacific Biodiesel is planning on expanding to hemp, or why Levi’s is now making “cottonized hemp” for some of their denim products, or why hemp is being called one of the most versatile crops ever, or why hempcrete, a carbon-negative material, is being looked at as a building material and replacement for concrete. Not as far ahead in terms of market as hemp, miscanthus shows promise. A recent $2.5 million private investment boosts Terravesta and their miscanthus plantings, and some research at University of Illinois is looking at how to better grow it in colder climates. If you don’t have some hemp or miscanthus handy to plant this year for Earth Day, let’s talk about some carbon negative technologies. There’s the usual carbon capturing folks we usually think of like LanzaTech, who say “no carbon left behind,” but there are other newcomers and carbon go-getters out there giving us hope too. There’s Oberon Fuels which makes DME and methanol from various methane and carbon dioxide sources, using its proprietary small-scale process. They are facilitating the growth of the DME transportation industry by converting biogas and other hydrocarbon rich waste streams to higher valued commodities such as DME. Opus 12 developed a device that recycles CO₂ into cost-competitive chemicals and fuels. Their technology bolts onto any source of CO₂ emissions, and with only water and electricity as inputs, transforms that CO₂ into some of the world’s most critical chemical products. Opus 12 was one of six clean energy startups selected from around the country to be incubated in the first cohort of the prestigious Cyclotron Road program at Lawrence Berkeley National Lab. As reported in the Digest in 2017, ExxonMobil is putting some R&D time and money investment into carbon capture technologies as well. And Shell has said they are going carbon negative with their commercial-scale deal with SBI that gives them access to a fuel that emits minus 14 grams of CO2 per megajoule of energy, instead of the usual 94 grams of CO2 that petroleum fuel emits. BASF has ambitious goals like achieving CO2-neutral growth until 2030, a dedicated Carbon Management program, and new innovations when it comes to CO2 as well. As reported in The Digest in January, they launched four groundbreaking projects for CO2-reduced future production processes – new catalysts, hydrogen, olefins, sodium acrylate and more. BASF is also presenting a new approach for using CO2 as a chemical feedstock: the production of sodium acrylate from ethylene and CO2. Sodium acrylate is an important starting material for superabsorbents, which are widely used in diapers and other hygiene products. A few years ago, researchers at the BASF-supported Catalysis Research Laboratory (CaRLa) at the University of Heidelberg were able for the first time to successfully close the catalyst cycle for this reaction. In July 2018, the Digest reported on a new €7 million EU Horizon 2020-funded research project, that was kicked-off with intentions of supporting EU leadership in CO2 re-use technologies. BIOCON-CO2 aims to re-use excess CO2 produced from the iron, steel, cement and electric power industries to create value-added chemicals and plastics. This will be achieved by developing a versatile range of conversion techniques using low-energy biological systems such as anaerobic microorganisms, aerobic microorganisms and enzymes to produce key chemical products including industrial acids and alcohols. Speaking of government goals, Sweden has a goal of going carbon-neutral by 2045, followed by negative emissions thereafter. Maersk, Danish shipping leader, also pledged to go carbon-neutral by 2050. In Finland, the Digest reported in 2017 that Helsinki airport was going achieve carbon neutrality earlier than its expected 2020 date thanks to using biofuel in all ground vehicles and a new 500kWp solar array. It seems carbon is getting lots of attention in the research areas too, as a promise of a better future for all of us and our planet. Just last week, University of Queensland researchers said they created a carbon negative way of generating power from biofuels that does not produce GHG gases at all. Using gasification, they say their method becomes carbon negative when combined with carbon capture and storage (CCS) methods. In February 2018, the Digest reported that Ohio State devised a process that under certain circumstances can convert coal, shale gas and biomass into electricity or syngas, while consuming carbon dioxide at the same time. In some cases, the technology not only consumes the full amount of carbon dioxide it produces, but also additional carbon dioxide from outside sources – and that’s the carbon negative moment. Argonne National Labs GREET model is showing that under certain circumstances R-CNG produced from anaerobic digestion of food waste is net-carbon negative over its lifecycle, including production, use and avoided emissions. 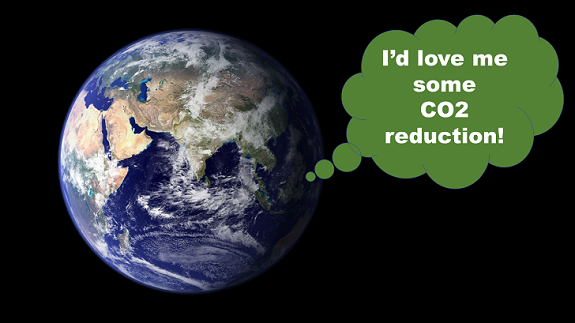 That means making and using it actually results in lower atmospheric GHG than if the fuel were never made or used. In April 2018, the Digest reported on the $20 million Carbon XPRIZE finalists, which were quite an interesting bunch. The goal of the XPRIZE is to challenge teams to transform the way the world addresses CO2 emissions through breakthrough circular carbon technologies that convert carbon dioxide emissions from power plants into valuable products such as enhanced concrete, liquid fuels, plastics and carbon fiber. And that’s just what many of those companies are doing. This is but a sampling of carbon negative and carbon capturing technologies out there already in market and being developed. There are many pioneers out there working on solving this crucial problem. The downside – it’s a global problem that doesn’t care about country borders or boundaries or races or gender, but the good news is as a human species, we have the ability to “think globally, act locally” and develop new methods, new technologies, new ideas for addressing CO2 that could in fact save our planet and save ourselves. We think Dr. Marcius Extavour, XPRIZE senior director of Energy and Resources got it on point when he told The Digest last April, “We think carbon capture itself is a huge topic. These teams are showing us amazing examples of carbon conversion and literally reimagining carbon. The diversity of technologies on display is an inspiring vision of a new carbon economy.” We agree, and that gives us hope on this 49th Earth Day. In India, researchers from the International Centre for Genetic Engineering and Biotechnology, DBT-ICGEB Centre for Advanced Bioenergy Research discovered that a robust yeast strain can produce up to 15.5% more ethanol when glucose or lignocellulose biomass — rice and wheat straw — is fermented and has been isolated. With India’s biofuel target going from the current 5% to 10% by 2022, researchers are looking at ways to get more ethanol from rice and wheat straw to meet the growing requirement.